JOIN US IN PLEASANTON, CALIFORNIA THIS SATURDAY – Join Hundreds of People at Our Event with Maximum Networking! 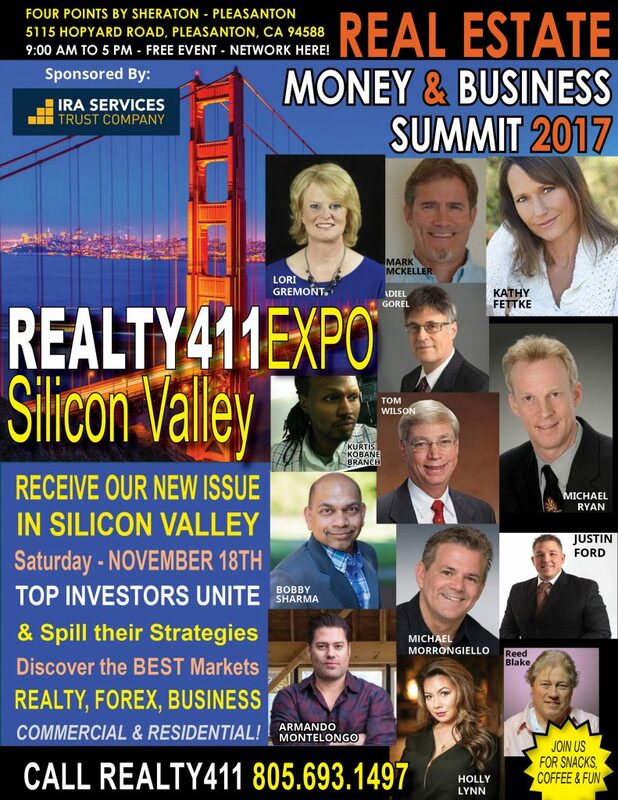 Realty411 expos are created and hosted by a California accredited investor with 24 years experience in print journalism. Realty411′s publisher has owned property and invested in California since 1993 and is an active accredited investor with numerous both in-state and out-of-state rental properties. We are already successful real estate entrepreneurs and antique dealers based in Santa Barbara County (known as the “American Riviera”). Our complimentary expos and magazines were designed to assist and empower others to also growth wealth with real estate. We also believe in diversification and enjoy learning other investing options. We own multiple businesses as well. Our expo offers FREE ADMISSION, plus join us early for your BONUS TICKET for complimentary coffee, pastries and Mediterranean appetizers! We like to have fun too. Learn How to Profit in this NEW Economy with Real Estate and Personal Finance Strategies to Position You for Wealth! >> Learn FOREX – the Largest Economy in the World, which Trades Trillions of Dollars PER DAY!! >Meet a Real Estate Broker who is adding Trading Into His Life and Portfolio. PLUS LEARN MULTIPLE STREAMS OF INCOME AT THIS EXCITING AND UNIQUE EVENT – AS SEEN IN ALL THE LOCAL MEDIA – SINCE 2007, REALTY411 HAS PRODUCED COMPLIMENTARY EXPOS AND PUBLICATIONS – OUR MISSION IS TO INCREASE FINANCIAL EDUCATION AND HELP AS MANY PEOPLE AS POSSIBLE INVEST IN REAL ESTATE TO IMPROVE THEIR RETIREMENT! TICKETS TO AN EVENT OF THIS CALIBER NORMALLY SELL FOR HUNDREDS OF DOLLARS. BE SURE TO TAKE ADVANTAGE OF THIS OPPORTUNITY. WE ARE THE “ORIGINAL” REALTY INVESTOR MAGAZINE! MEET THE REI DIRECTORS FROM NORTHERN CALIFORNIA HERE! Tom K. Wilson began building his personal real estate portfolio in the 70′s. He first invested as a part-time activity, and then after thirty years managing manufacturing and engineering in some of Silicon Valley’s pioneering technology companies, he put his business and management experience toward full-time real estate investing. Mr. Wilson has bought and sold more than 3,500 units and over $250 million of real estate, including three condo conversion projects, nine syndications, and eight multifamily properties. He founded and owns Wilson Investment Properties, Inc., a company that has provided over 500 high cash flow, high-quality, rehabbed and leased residential properties to investors. Active in real estate associations, Mr. Wilson is a frequent speaker on real estate investing where his candor and competency makes him an audience favorite. As part of his outreach, Tom provides mentoring to new investors. His weekly radio show Real Estate Radio Power Investing provides extensive education on real estate investing.